"The Best Food Starts with the Best Ingredients! 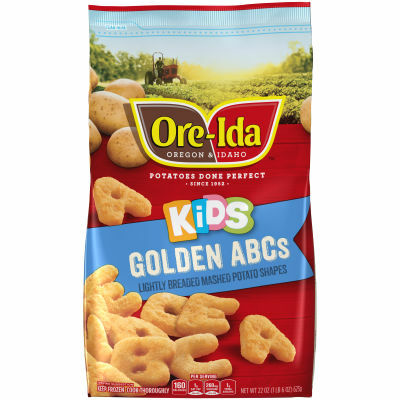 The Ore-Ida potato experts and inventor of Tater Tots(r) potatoes are proud to bring you Ore-Ida ABCs Mashed Potato Shapes, an easy way to enjoy the mashed potatoes your family loves in fun alphabet shapes! And, each bite of real mashed potatoes is seasoned with salt and contains no artificial colors or flavors so you can feel good about serving them to your family. We hope your family has as much fun eating them as we do making them! ; Real potatoes seasoned with salt. Guaranteed smiles." Serving size 3oz (84g/about 4 pieces).